On Saturday 5th March, it’s the first ever Women’s World Tour race, and one of the most exciting events of the season – the Strade Bianche! It’s only been raced once, in 2015, but it became an instant Classic, and such a wonderful way to kick off the new World Tour, starting and finishing in beautiful Siena, and including 22km of those iconic white gravel roads. I’ll always be gutted that we can’t watch it live, but we can still follow it as it happens, and watch the highlights. There’s no specific women’s Strade Bianche hashtag yet, only the unisex #StradeBianche but that may come – & we can follow the World Tour #UCIWWT hashtag too. 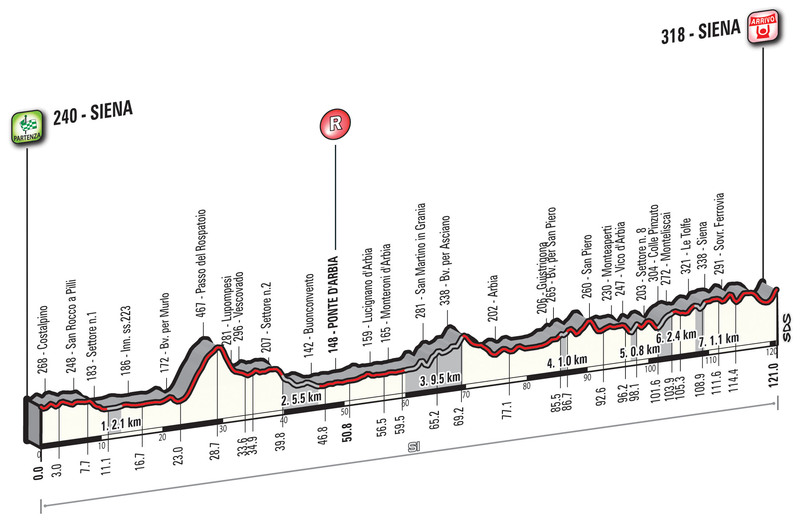 The race twitter is @StradeBianche, and the UCI’s Women’s Cycling account will be tweeting too – and I’ve got my updated list of people tweeting live from the race, which I find the easiest way to follow. The race will start at 09:20 European CET (8:20am UK GMT; 7:20pm Australian AEDT; 3:20am USA EST) and is due to finish between 12:45 & 13:15 CET (from 11:45am GMT; 10:45pm AEDT; 6:45am EST) – the full timings in CET are from page 14 of the racebook, which has tons of information about the race. UPDATE! There look like there will be highlights on RAI Sport 1 (watch here) at 17:00 CET (4pm UK GMT; 11am USA EST; 3am Aus AEDT) – thanks Velorooms. UPDATE! That’s what’s on the RAI programme guide, but they’re tweeting 17:30, so it could be then, too! We can always hope there are clips of the women’s race shown in the men’s coverage – last year, RAI showed 15 mins after the men’s was over. If you want to watch and see (it’s a gorgeous race, you really should!) and it’s not being shown locally, I’d load up Hola or Tunnelbear to Italy and watch live on RAI – or you can find streams for that here and here. eep an eye on the RAI Sport TV guide on the day in case more turn up (scroll down for RAI Sport 1 & 2), and there will be highlights in the following week on the UCI YouTube. I’ll put videos etc on my Women’s Cycling Tumblr as I see them, and I’ll put up a post full of them after the race. The route details are here, and the startlist is here (likely to be updated near the time, so I’ll use the Cycling Fever version). I’ll keep updating this with any more information as I see it – and if there’s anything you want to share, please do tell me in the comments or on twitter – and of course I’ll be chatting on twitter throughout the race if you have any questions.